For children, playing with toys is an everyday affair, and at times, one which is taken for granted. It is sometimes easy to overlook the fact that there are many children in India, who are deprived of the happiness that is derived from playing with toys. 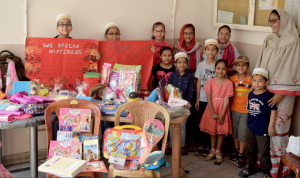 Keeping this in mind, on the occasion of the International Day of Happiness, the Dawoodi Bohra Women’s Association for Religious Freedom (DBWRF) flagged off a nationwide toy donation drive, led by children from the community. The children handpicked toys from their own collection and donated them to the needy. The drive, which was held across Maharashtra, Karnataka, Andhra Pradesh, Gujarat, Madhya Pradesh and West Bengal, was a part of DBWRF’s Power of Giving initiative, and brought to the fore values of generosity and selflessness that Dawoodi Bohra children are raised with. In Maharashtra, the toy donation drive was conducted in Kandivali, Mumbai, where a group of women and their children distributed toys and stationery to underprivileged children at the Bharat Bharati High School. They also brought smiles to street children studying at a temple nearby, by handing out games and food packets. Members of the DBWRF further spread happiness when they donated toys and books to wards at a prominent cancer hospital in the heart of Bengaluru. Vizag (Andhra Pradesh), Ujjain (Madhya Pradesh) and Ahmedabad (Gujarat) saw orphans smiling with joy at the toys they received. Enthusiasm was high as children wrapped their gifts in a smiley covered paper to distribute at Ahmedabad’s Mother Teresa Orphanage Home as well as Ujjain’s Sewa Bharati Orphanage. The drive received an overwhelming response from organisations across the country. They expressed gratitude to DBWRF for the thoughtful gesture. It also had a profound impact on the minds of the children who donated their toys, as they were able to see the difference they made to the lives of orphans and those in need. Calling this a novel way to celebrate the end of their exams, the parents and children were more than happy to participate in this endeavour. The Power of Giving initiative was inspired by the teaching and principles of the community’s spiritual leader His Holiness Syedna Mufaddal Saifuddin TUS. 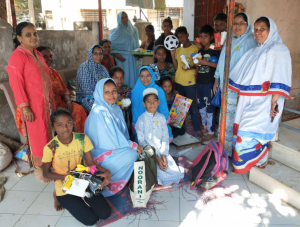 Dawoodi Bohra women have already conducted several outreach programmes across the country, which include first aid training, digital literacy programmes, food donation drives, medical camps and more.